The "talking statues" of Rome are statues on which, since the sixteenth century, the Romans putting up (and still continue to post) anonymous messages, containing mostly critical and satirical poems against the rulers. 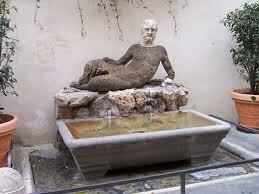 The messages are often called "pasquinate" by the most famous talking statue, Pasquino. statue of a lying satyr, who, after today you give to the cause of the deformity contracted by time, is also called the old way of Baboon Pauline Street, already opened by Pope Paul III in which is situated above a fountain. Fragment of a statue or group representing Menelaus supporting the body of Patroclus. It was found there at (Pasquino piazza) at the beginning of the sixteenth century, near the shop of a tailor, died shortly before, which was very satirical spirit and was named Pasquino. Exposed just dug up the statue at the sight of the people, he was soon called Pasquino and became the place of public display of satire, so called since then "lampoons". 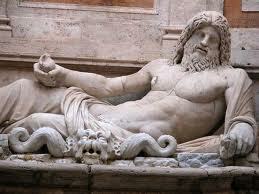 Colossal statue of the ocean, existing today in the courtyard of the Capitoline Museum, and formerly located at the Forum of Mars (or Augustus), and therefore commonly called Marforio as a way of calling the bad Marforio district that runs between the slopes of the Capitoline Hill and the site of that hole on Mars. The people Marforio takes a ridiculous subject, and you do speak out on so-called "lampoons" satire or public, where once the Romans had spirit and reputation. Fragment of a colossus from the waist up, but no arms and nose. From costume Egyptian pallium grouped in a single node on his chest, he argues that the simulacrum Winckelmann to have been a Isis. Now it's in Piazza San Marco. The historic centre of Rome is rich in details and particulars which aren’t o ften perceived by whom lives daily in it and whom usually goes through the alleys of the city. 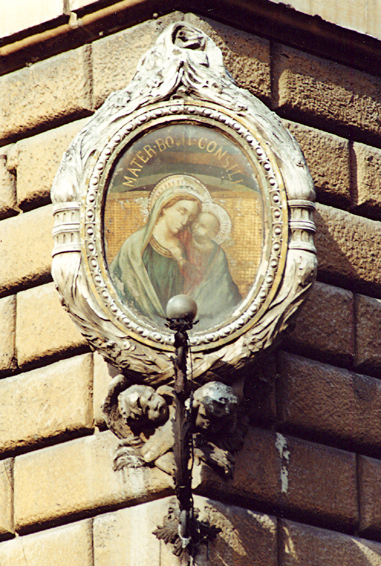 The less inattentive tourists notice and indicate the various Madonnas at the corner or on the facades of almost all the palaces in the centre of Rome. They are votive aedicules dedicated to the Virgin and therefore they were soon defined as the “Madonnelle di Roma” (little Madonnas). 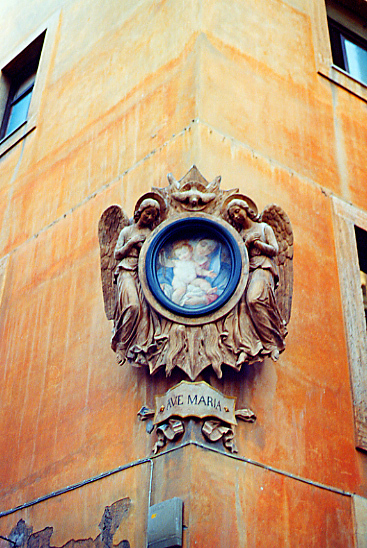 The Madonnelle protected the houses and the roads and are a cultural and architectural integral element of Rome. The origin of the Madonnelle dates back to the ancient Rome, when some aediculae were dedicated to the Lares, namely the little temples situated at road intersections. 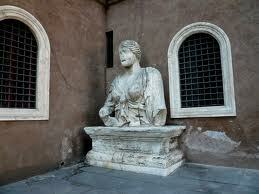 These aedicules became place of worship, where you could take offers in exchange for protection. Their care and maintenance represented since then a real work, a sort of social and cultural commitment to transmit. Today the ancient pagan images are replaced by the Madonnelle (today they are about 3000! ), often to recollect miraculous events. 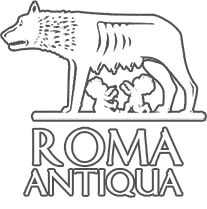 Besides , nowadays many initiatives, thanks to planned tours allow to run through the roads of the centre of the city to discover the secrets of Rome, which often the inattentive eye of the tourist doesn’t perceive. It’s the name given by the Roman people to the fountains of Rome. They are about 2500, on different places of the city, loved by the people. They offer good and fresh, wonderful refreshment during the summer. The first mountain in Rome dates back to 1872 and it had three dragon-shape shafts, but in 1935 they were replaced by models of cast iron (currently in use) with only a shaft from which the nickname “nasone”. 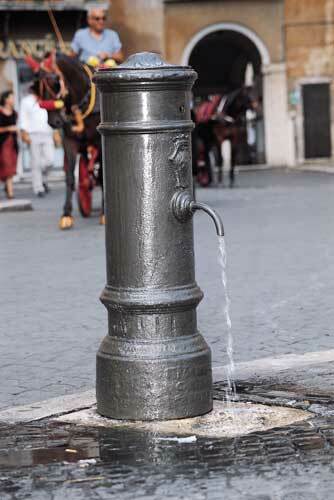 Many years ago, the municipality, tried to introduce the tap and the buttons to the fountains, because of their excessive consumption of water, to limit the wastes, but the Roman people opposed strongly to this cultural modification which guaranteed any more fresh water and therefore the robs of taps and sabotage increased notably, such that the project was abandoned.